Safety should be a high priority for homeowners who have a pool on their property. Steps for swimming pool safety include installing security features and staying alert while people are swimming. In this article, we have listed some precautions for your swimming pool to keep your family and friends safe all season long! 1. Swimming pool safety should begin with a pool in great condition. Water testing and cleaning should be done regularly and the chemical levels adjusted so that everyone can swim in clean and safe water. Here is an easy guide to balancing pool chemicals. 2. Make Sure Everyone Knows How to Swim. More than 200 kids drown in backyard pools every year, according to the Red Cross. Your family’s new swimmers and the inexperienced should wear a U.S. Coast Guard-approved life vest or water bands on their arms. Enroll inexperienced swimmers in swimming lessons as soon as possible. 3. Supervise children at all times. This means taking your eyes off your cell phone. You cannot use your phone and keep an eye on children at the same time. If you’re unable to give 100% of your attention for whatever reason, assign the task of watching the children to another responsible adult who can monitor the water and the kids. 4. Enforce rules and behaviors for safety. Keep kids away from drain covers. They should be taught that running around the pool perimeter is not allowed. If the pool is too shallow for diving, make sure there is a sign and that everyone is aware. 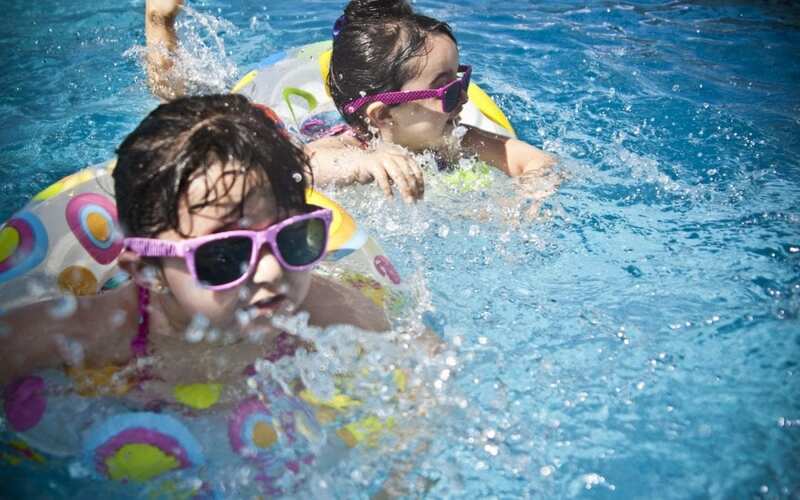 Children should be encouraged to swim with a buddy for maximum swimming pool safety. 5. Everyone in the family should know what to do in an emergency. Have first aid equipment available and know how to use it. Those who can learn CPR should take a class. First aid and water safety classes are available from the Red Cross for family members to learn swimming pool safety. There should always be a phone at the pool in case of an emergency. With regular maintenance and pool inspections in addition to these tips, your swimming pool safety and enjoyment will be enhanced. Swimming pool safety is the responsibility of the homeowner, yet all who use the pool should be aware of the rules to keep people out of harm’s way. Republic Home Inspections provides home and commercial building inspection services to the Greater Las Vegas area. Pools and spas are included in our general property inspection. Contact us to schedule an appointment.